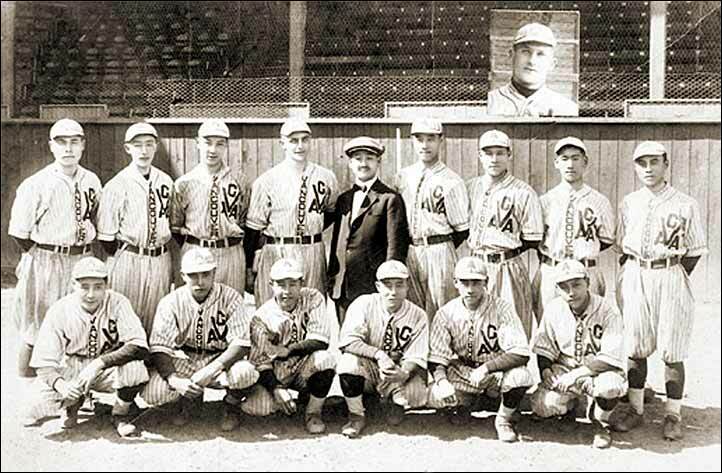 The 1921 Asahi All-Star team made a tour of Japan in August-September, 1921. Back row (left to right) - Joe (Yahei) Nimi, Ted Furumoto, Harry Yoshioka, Ernie Paepke, Asahi president Dr. Seitaro Nomura, Yuji Uchiyama, Unknown, Mickey Kitagawa, Tom Miyata. Brown, Larson and Paepke were recruits from other teams in Vancouver ball. We have identified three others who played with the Tigers - Abe, George Kato and M.(Ross) Yonemoto.